Check out the goings on in our social media world from Facebook to pleasantonexpress.com. Congratulations to Roxanne Bazan of Pleasanton! Her photo won our first ever Instagram photo contest. We asked folks to tag their photos on Instagram from Cowboy Homecoming with #expresscowboy and capture fun moments. 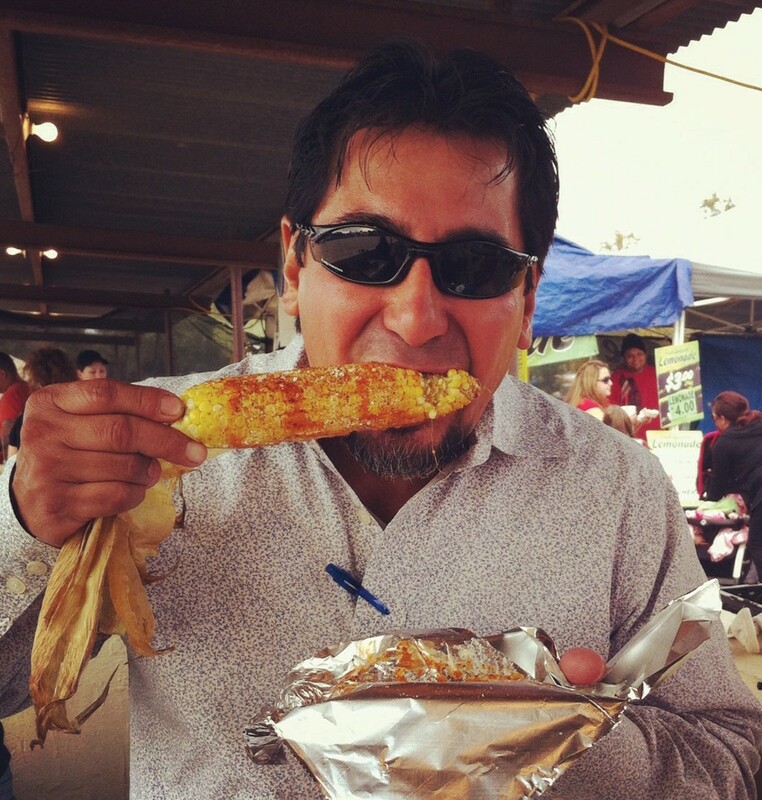 Roxanne’s photo was a shot of her brother-inlaw, Frank Escalante, diving into an ear of roasted corn at a food booth. You can see the pic below (right). She won a free year subscription and a commemorative print of the winning photo. 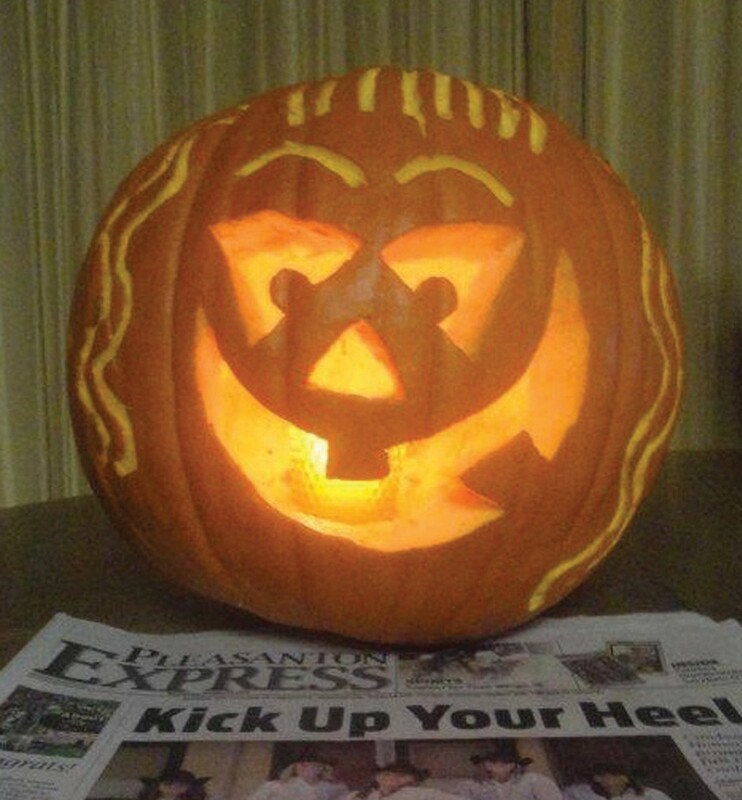 Thanks to all who entered our Pumpkin Carving Contest. We are excited to announce that Critter Johnson is the overall winner! Congrats! The kids who entered will all receive movie passes from Plextex 4 Theater and you can see 8 year old, Critter’s prize winning pumpkin pictured below (left). You can find all of the kids’ entries on our Facebook page. With the great success of our first Online Photo Scavenger Hunt we will be having a second one after the new year. The plan is that this time around we’ll do it 80s style. Be ready to solve clues, win prizes and see some great hairstyles from the awesome 80s. Every Friday we ask for Brush Country Football fans to post to our Facebook page or email pictures showing their Eagle, Indian, Trojan or Aggie spirit! Whether it is your office or your toddlers who have spirit we wanna see them! You can send them in a direct message or email to jmachado@pleasantonexpress.com. This past Friday, we announced Angela Franco as the winner of our 3,000 Facebook Likes drawing. She won a UT Longhorn pullover and cap. Congrats to Angela! We will be giving away a Brush Country Team Fan Package to a lucky Twitter follower. The fan package will contain team spirit items from the Atascosa County team of your choice. Follow us on Twitter @PE1909 to enter the drawing. The winner will be contacted via Twitter. Get ready to show your spirit!! 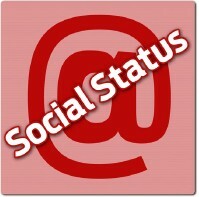 Got a question or a suggestion for Social Status? 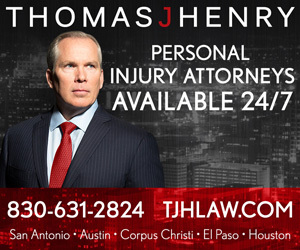 Email me, jmachado@pleasantonexpress.com. Critter Johnson is the overall Pumpkin Carving Contest winner. This 8 year old from Pleasanton turned in a great pumpkin. She and all the other children who entered will receive movie passes from Plestex Theater. Thanks to all our participants. You can see all the entries on our Facebook page. Roxanne Bazan of Pleasanton won our first ever Cowboy Homecoming Instagram photo contest with her photo of her brother-in-law, Frank Escalante, diving into an ear of roasted corn at a food booth. We asked folks to capture their Cowboy Homecoming moments and Bazan came out on top. Thank you to all who entered. With over 60 entries we plan to do this again.